Will I Gain More Horsepower With An Exhaust System? Horsepower is calculated by multiplying torque by RPM. Therefore, if a new exhaust system adds just 10 lb-ft of torque at 5,000 RPM, that will result in a horsepower increase of 9.5 hp. While that might sound like a solid horsepower gain, an extra 10 lb-ft of torque at 5,000 RPM usually doesn’t do you a whole lot of good in day-to-day driving. After all, how many of us run our engines at 5,000 RPM on a constant basis? Because horsepower is a function of RPM, it’s very easy to show big horsepower gains on paper. Diesel trucks are a great example – because they generate gobs of torque anyways, adding an extra 35 lb-ft of torque at 3,300 RPM results in a gain of 23hp. This number may seem impressive, but an extra 35 lb-ft of torque at 3,300 RPM isn’t that useful to your typical diesel truck owner. It’s a good increase to be sure, but it’s not usable power. The other reason that you shouldn’t put a lot of stock in manufacturer estimates is that dyno results are fairly easy to manipulate. When a vehicle is tested on a dyno, there can be significant variations from test to test without any change to the engine. If a manufacturer takes their worst run from their “before” tests and their best from “after” tests, they can show a really big gain that’s mostly due to normal variations between runs. In other words, exhaust system performance estimates are always very generous. If the kit from Flowmaster supposedly adds 8 hp and the kit from Magnaflow supposedly adds 13 hp (or vice versa), chances are good that both perform pretty close to the same. If you want to know how much power you can expect to gain from adding an exhaust system to your car, assume that your engine will get 2-5% more powerful. More specifically, large engines like a big 6.0L V8 typically see about a 2%-3% horsepower increase. Smaller engines, like a 1.8L 4-cylinder, typically see a 3-5% horsepower increase. 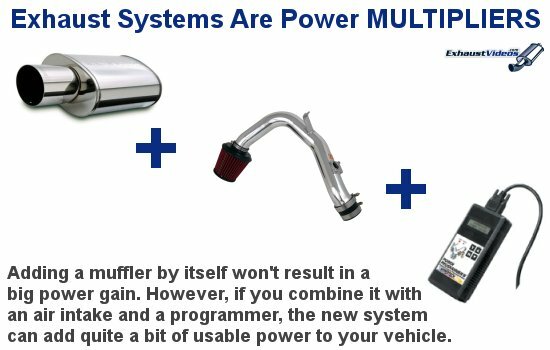 HOWEVER, exhaust systems have a multiplying effect if you combine them with other add-ons. The exhaust system by itself won’t add a lot of power, but combined with an air intake and a performance chip or power programmer you could see a significant increase in performance. You’ll also see a slight increase in fuel economy (assuming you keep your foot out of it, of course). Adding an after-market exhaust system to your vehicle isn’t just about adding some more horsepower or improving fuel economy. You’ll enjoy a sportier exhaust note, better throttle response, and hopefully driving will be just a little more fun. Considering how inexpensive an after-market muffler is, it’s a nice way to customize your vehicle on a budget. The icing on the cake is slightly more power and improved fuel economy. How much are those programmers? if im runnin an after market muffler which is a flowmaster should i install a high performance intake also? justin – There’s definitely an advantage in upgrading both your exhaust and your intake, and I would recommend both. Even if you just add a performance air filter. Any idea about the gain with the combo you suggest? You said 2-5% only the exhaust so I guess around 10 with the combo? Depends on the engine. As a general rule, the combination of a programmer, exhaust, and air intake can add at least 20hp. The compromise is that your vehicle will be louder and that most after-market tunes require you to run premium fuel. I have a 1977 Chrysler Cordoba with the LA 360 4bbl making a factory 170 HP. I will be putting a pair of chrome shorty headers along with an X-,Pipe 3″ dual exhaust system with a pair of high flow performance mufflers. I will also be replacing the factory cats with after market high flow cats. Can you give an idea of an approximate increase in HP and TOURQE? I will also be installing a new set of iridium plugs and synthetic motor oil. Also I will be putting in an electronic HGH performance ignition system with the factory air cleaner with a K&N air filter. With these changes I given, what kin of HP gain can I expect? The only other upgrade I plan on a bit later, will be a high performance intake manifold with a rebuilt factory Carter thermoquad carburetor. And what type of HP gain from the new t intake give me? Bob – No idea. A 360 can easily make 300hp, and with massaging could jump up to 400hp…but this is an old car with what is (I’m assuming) an original motor. You could very easily stress the motor. My advice is to get with the local classic performance shop, ask for some quotes on things, and see what you can learn. You also may find that there’s a rebuild kit for your 360 that boosts power, with new cams, upgraded internals, etc. Good luck. I have a Dodge Charger 100th year anniversary edition. It has 370 Hp. BY how much will the Hp increase if I add a varex exhaust system ?? I read earlier that if I install Magnaflow exhaust system, I could gain a min of 20hp. Is that true?? Your explanation will be highly appreciated. Ok so hi guys I just bought a 2015 Corolla s 1.8L. Now Its a good reliable car. I’m just trying to gain more hp. And I wanna do that without stressing the engine. I’m just think about getting a exhaust system, intake, and a computer chip. Any suggestions.?? To how how much hp I can gain with that?? Will it affect my engine too much?? It only comes with 132hp. Which is not enough lol. Plz suggest and advise on what should I do. Moe – I wouldn’t try anything radical with the newest Corolla, at least not until the after-market releases some parts specifically designed for this vehicle. I’d say you need to wait 12-18 months to see what comes out (if anything). hey, I’m thinking about doing the same thing with my 2012 Corolla. Did you get the K&N cold air intake? How’s the performance? Edgar – Unless you buy a turbocharger or something, you’re not going to notice a big difference regardless. It’s still a 4-cylinder economy car. Girish – I would suggest that you do not buy G-Force chips. They do not add any power – all they do is mess with the fuel maps. I’ve tried numerous times to get them to provide dyno testing to prove their claims and my requests have gone unanswered. But a cat-back + intake will add 10-20hp, all things being equal. Not a ton, but definitely not bad. Just find a quality tuner and you can pick up another 10-20hp. I have a 2002 yukon. I’m putting on headers, cross over pipe new cats and a full cat back system including the muffler. All of it is from Flowmaster. How much of an increase will I see? Will not be doing an intake, next step is a supercharger which is why I got the full exhaust. But the supercharger will require getting a new trans. Stock one can’t handle all the extra power. I have a mustang 2008 v6 . I am adding a shorty pypes headers,AEM cold air intake,True Dual Header Back Exhaust System – Pypes,Ignition Coil Pack Screamin’ Demon and Superchips 1841 F4 Flashpaq. What horsepower increase should I expect. so If I calculate this on my car I will gain 172 hp at max output? or am I doing something wrong (obviously) because at 6600 rpm (max output) x 137 = 904200/5252 = 172 hp ???? somebody please explain I am confused. TJ – If you’re referencing the horsepower equation at the top of the page, that’s not a tool you use to predict HP – it’s a formula you use to calculate it based on a torque rating. It’s in the article to show that horsepower is really a proxy for torque at a specific RPM. If you read further down, you’ll see that your typical gains in power range from 2% to 5%, with most vehicles coming in closer to 2% than 5%. If you have a 150hp car, your probable exhaust system horsepower gain will be 3-8hp. Oh, haha, thanks for the info it’s clear now, it was actually a stupid question coming from me! can you tell how much horsepower do i gain ? Alaa – Depends on the specifics. 20hp on the low end. Could be a lot more, depending on the programer and how you measure. I have a 2003 Mustang GT. The current mods on it are BBK Cold air intake, Borla Catback Exhaust, and lowering springs. I was wondering about how much power do you think the cold air intake and Borla cutback exhaust added. I also have a tuner it a BAMA ITSX wireless tuner I haven’t added the tune to the vehicle yet, but do you think that’s a quality tuner in your opinion and how much would that tuner add do you think? I’m also having 3.73 gears installed sometime this week with a JBA Off Road H pipe. I’m thinking that the BBK Cold air intake and the Borla cutback will add about 15-20 combined. I think the tuner may add another 15-20. The off road H I think would add about 5. The gears would not add any, but would improve acceleration and allow to get into power band quicker. Jason, you seem pretty knowledge and any thoughts from you would be appreciated. I have a Honda Jazz engine L15A1 engine, I have already done a level 1 upgrade, I have installed 4-2-1 exhaust header & want to change stock exhaust system post catalytic converter till the muffler, how much power gains should I expect, the 4-2-1 header highlights 3-4 bhp dyno gains from the manufacturer, how much gains should I expect with changes about above. Berto – Check the dyno charts on whatever you’re looking at. I have an 2006 Dakota SLT V8 4.7L Quad cab 4×4 . I added the Super Chip programer to the truck, now I can eat any F150’s for lunch at any speed, especially starting at 100km side by side . Next is some custom dual exhaust from the muffler shop. I drive an 2002 GM duramax, lb7. I have an S&B intake, EFI live (spade) tuner, and an exhaust system with a 5″ tip. I guess I’m a little bit confused on the how calculations work? Heather – The calculation in the article is regarding horspower…if you know how much torque your exhaust system adds, you can calculate horsepower. Hey what’s good. I’m whipping a 07 TL Type S 3.5 do you know of any websites where I can find performance headers for my car? Also what performance chip would give me the best HP? Please help me out. Thanks. Drew – You can probably buy headers that fit the 3.5L V6 Accord and put them on your TL. I’d check with OBX, DC Sports, Megan Racing, etc. I have 92 camaro L03 170 hp 255 tq. it has a chip, headers with straight one 2 and half inch pipe with flow master with high flow intake. How much hp to I gain? With accel distributor and coil. I have a 2015 Chevy SS which I put a Rotofab CAI. what exhaust system would recommend for best sound and HP gains. Also would you do headers and exhaust or cat back type exhaust? Thanks for advice. Daniel – I have no brand recommendation, only I’d look at Corsa for sure. They produce some pretty good Vette exhausts IMHO. As for what I would install, I’d stick with a cat-back to start. The SS uses the Corvette’s motor and exhaust manifold, which is carefully tuned. Unless you’re making some other changes – like adding a supercharger, cam changes, or some other intensive update – I’d leave the stock manifold alone. It’s as good as anything you’ll find on the aftermarket (probably better). @Jason, Thanks for advice, I have a Corsa coming soon and will hold off on a tune until I put in the supercharger(a bit later). Looking to add significant horsepower and torque to me 5.7 2015 dodge challenger. Where should I start and what brands are recommended? I have a stock 2014 GMC Sierra crew cab with a 5.3L V8. I just had installed a Borla Cat Back exhaust with air intake. Sounds awesome and feels like it has more power. Does anyone know what kind of HP/Torque gain I can expect if any? Paul – Anywhere from 10-20hp, and about the same amount of torque. If you get an engine tuner, you can double or triple that, especially now that you have a freer flowing intake and exhaust. Hey I Have A 2004 Mitisibushi Eclipse 2.4l & I Was Wanting To Upgrade My Exhaust System & Get A Cold Air Intake. How Much Horsepower Would It Gain. I Don’t Know Much About The Programmers But Would Like To Know The Price Of One. Murad – Programmers run from $300 to $1200, depending on the type of vehicle and the brand of programmer. They add a good amount of power, however, so they’re usually a good investment. Most programmers will find a way to increase your engine power output 10%, more on vehicles that are turbocharged. As for adding an exhaust and cold air intake, you’ll find the combo increases engine power about 3%. On a 200hp car, for example, that’s 5hp+. On a 300hp car, that’s 10hp+. I have a 2008 dodge caliber with a 1.8 litre engine , 5 sp manualI just added a new flowmaster muffler and a bigger air intake filter…will this increase my hp any. David – Probably, assuming the muffler and air intake were designed for your specific vehicle. Great article. I’m thinking about getting a Perrin Non-Resonated catback exhaust for my 2017 WRX CVT. I am wondering if I should also get an air intake as soon as I can as well and/or anything else that won’t void my warranty, so chip tuning is out of the question for the time being. Thanks! Jonathan – Sorry I missed your comment. First, whomever told you that a tuner or programmer will void your WRX warranty is full of baloney! 🙂 There’s something called the Magnuson Moss act that makes it illegal for any manufacturer to invalidate a warranty just because an accessory was installed. Unless you add a tuner/programmer that causes a major problem somehow (and that is nearly impossible, especially if you go with a brand name tuner), you’ve got nothing to worry about. If you’re paranoid, you can unplug the tuner before you take the car to service (and/or revert to the stock tune), but I wouldn’t worry about it. Second, the three things you want to look at on a WRX beside the tuner are intake, downpipe, and cat-back exhaust. There are some systems that combine downpipe and exhaust that are worth a look too. It’s not hard to had 50-75hp to a WRX with the right parts. In terms of brand names, I don’t have any strong feelings. Just look for something that has dyno chart data. Manufacturers that don’t publish dyno charts usually aren’t selling good parts. I just put a K&n cold air and super 44 exhaust on my 01 jeep grand cherokee i6 4.0l…any idea what I’m increasing there? HP and Torque wise? Would love your input, thank you! I have a 2010 Jaguar xfr with 5.0 L V8 superchared engine with 510hp stock , so what is the safest way to get it to reach tle 600hp range ? And what kind and brands of parts do you recommend? Sabana – You can probably hit 600hp with a custom tune, but I’m not certain. Usually, the automakers leave a fair amount of power on the table when they do forced induction. You can also put on a small nitrous kit – a 100hp boost isn’t really that much, and it’s very safe if you only use it at the track. Thank you for your reply , just saw it 🙁 sorry ! Honestly , i was thinking of putting an air filter and a tunning chip from RaceChip Ultimate which they said it can give more than 70bhp and more than 80Nm torque with 2 years waranty on the engine . What do you think ? Is that safe enough? Can it harm my engine or gearbox in any way? Sabana – It’s extremely unlikely any chip will harm your engine or transmission. Hi there I have a few questions I have a 2016 hyundai sonata sport 2.0t, does it really help out my acceleration and performance if I do the whole exhaust package? And have you ever heard of the performance chip how affected is it tors you’re vehicle? Thanks for taking the time of reading. Juan – A chip or tuner is a good option for most newer cars. Lately, auto manufacturers have been leaving a lot of performance on the table out of emissions and fuel economy concerns. I’d guess a tuner will had 20-30hp to your Hyundai, and maybe more. As for an exhaust system, yes, they do offer some power. But it’s not a lot – 5-10hp is pretty normal. Still, when you combine that with an intake and a tuner, you can add 30-50hp pretty easily. That makes a real difference. Juan – Tuners run $300-$1000, depends on the car. I don’t know what’s available for your vehicle – I’d suggest going to autoanything.com or maybe summit racing to find a tuner. Then, you just plug it in, select the program, and you’re good to go. Gary – Adding an exhaust system to your truck won’t impact your warranty, provided you don’t remove the DPF or doing something screwy with the downpipe. Hi, I have a 2014 GMC Sierra 1500. I recently put a K&N CAI and an edge evolution chip on my truck. I’m looking at doing an exhaust. What kind of power gains should I expect with a exhaust and is it worth it? I have been a fan of Corsa but is there a make that you would recommend? Thanks in advance! Johnny – Corsa is great, and I’d expect to gain about 10hp and 10 lb-ft of torque. My only advice is to ask a few people about drone…pickup trucks have giant resonators on the back of them (the pickup bed itself), and some exhaust systems make a heck of a lot of noise at highway speeds. You want to avoid that if possible. Gibson is another good brand. Hello.. anyone have an idea of the increase Hp/torque on a 2016 Dodge Dart Gt sport after adding the mopar cat back exhaust system and cold air/air inductor.? Daniel – I’d be shocked if the combination of an exhaust and intake added more than 10hp on a 2016 Dart. That car just doesn’t make that much power, so it’s not possible to add much power. Still, the combination of an exhaust and intake will sound great, and if you add an aftermarket performance tuner to the vehicle, you’ll enjoy an even bigger gain. Most tuners have a program for vehicles with an upgraded intake and exhaust that’s more aggressive with the fuel map. Hi there I have a vw passat 2003 v6 2.8L engine and I would love to put a cat back exhaust and air intake…. can anyone tell me how many hp i can gain with this upgrade ? Tim – Check the dyno chart on whatever kit/kits you’re looking at. The answer is there. Rick – If you’re running forced induction, you can throw all the tables away. Just go with the biggest set you can afford. Your engine will not be impacted too much by size. I have a 2010 mercedes c250. 2.5L V6. Install dual cold air intakes, resonator deleted and aftermarket flow through mufflers. Do you have a good recommendation for a tuner or chip to complement my set up? Or any other suggestions on where to go from here? Also if you ha e a guess on gains I incurred that be a bonus. Thanks allot guys! Luc – First, if you haven’t reached out to Frank at EuroSportTuning, I’d do that next. Guy knows his stuff. Second, most tuners will offer a custom tune based on your current configuration. I recommend talking to Frank because he sells all kinds of tuners and also runs a tuning shop. He can tell you what’s good. Hi I really enjoyed reading your article but I think you forgot to mention back pressure or maybe you did with a different term, but I was thinking of getting two resonators on the tips of my car exhaust for better take off what do you think? Israel – Backrpessure isn’t really a thing. It’s sort of slang for “changing the exhaust tubing size impacts performance in counter-intuitive ways.” You don’t actually want ‘pressure’ going backwards into the engine. You just want to size things correctly so that the exhaust pulses facilitate cylinder scavenging. As for horsepower, I’d guess the exhaust and intake are good for 10-15 hp total, the pulley is good for 5 hp, the throttle body spacer has no effect, and the programmer is good for 20hp. So, I’d put you at 215hp or so. – performance chip is supposably 40 horsepower but I think I’m only pulling 30 until I get it dynoed. = 268 or around there. David – There aren’t many companies selling tuners/chips for Toyota vehicles, but there’s a company called UniChip that makes tuners for Toyota brand vehicles. You should contact them and see if they have a kit that will work for your Camry. But to your question, an air intake adds 5-10 hp, and a cat-back exhaust will be about the same. So, not a whole lot…but it will sound great, and if you go for one of the unichip tuners you’ll notice a nice increase with the full set. What kind of tuner chip/programmer should I get for my v6 3.6 2018 Dodge Charger I already got a k&n cold air intake and magnaflow exhaust and how muc horspower do you think I have with just the intake and the exhaust system? Diego – With the 3.6, you’re not going to get a whole lot with an air intake and exhaust. 20hp max. A tuner will get you some more, but you might think about a supercharger. That 3.6L is the same engine that’s in the Wrangler, and there are a few companies offering kits for it. I have a 2011 GMC Sierra with a 5.3L with a K&N cold air intake and a Hypertech Max Energy programmer running the premium tune. Upgraded my exhaust to 3” from the converter back with a 40 Series Flowmaster muffler. What can I expect my horsepower to be with these upgrades?